← The Black Sea tea fields. Although Sumela receives more visitors each year, mainly Russians and Greeks, the place is still far from popular tourist routes. This Orthodox monastery, located 1.200 meters high in the mountains of the National Park Altindere, is one of those places that leave a memory forever. The beauty of the Valley of the Pontic Alps where it is, at the eastern end of the Black Sea coast, complete with valuable frescoes of the church built in a cave where it 1.600 years showed an icon of the Virgin Mary. Not to be missed..
To go to Sumela have to go to the town of Macka, in the province of Trabzon . If we go from the capital of the province, it is a journey of just over an hour we head towards the east and then turn south and we get into the Pontic Alps. Ascend a narrow valley on the road accompanying the river to Macka. Once there, turn left to go to the National Park Altindere. Although there are some good hotels in Macka, It is close enough to Trabzon as to and on the same day. Accommodation and attractions of the city are much more interesting than the picturesque village inside. 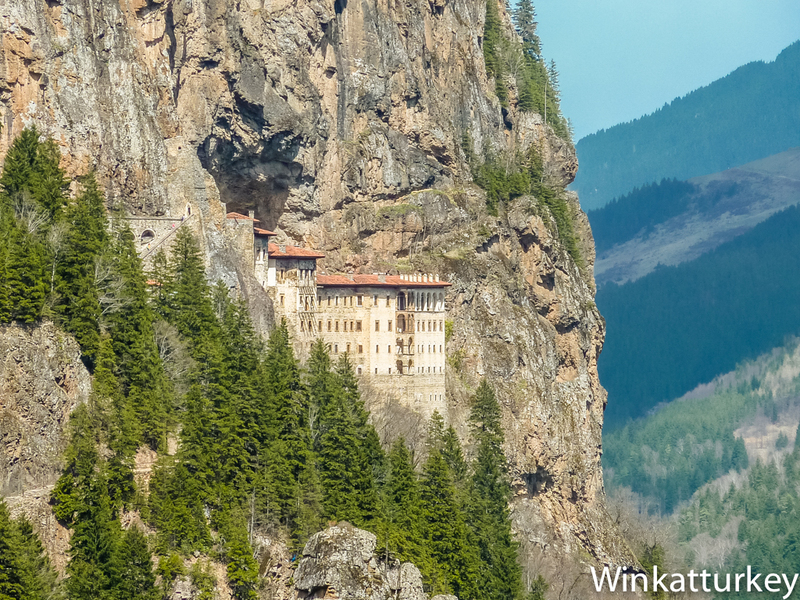 Once in the national park can walk up to the monastery on a climb that will take us some 30-40 minutes. You can also climb up a vehicle 200 meters from the entrance. Both ways can enjoy views of the valley and the monastery and will inevitably ask ourselves how it was possible to build on that stone wall. In 386 monks in a cave found an icon of the Virgin Mary, hence the Greek name of the monastery, Panagia, meaning “all holy” and is used to refer to the Virgin. Although always received the support of emperors, the monastery suffered periods of neglect alternating with other splendor until it ended with the way today preserved in the fourteenth century. The Ottoman conquest of the region brought to Sumela the special protection of Sultan Mehmet the Conqueror. The monastery was abandoned in 1923 because of the forced population exchange between Greece and Turkey. As the monks are not allowed to bring anything, They hid the valuable icon monastery under the floor of the chapel of St. Barbara. In 1931, a monk returned in secreted and recovered the icon to bring it to the monastery of Panagia of Soumela in Greece, where he is currently. The entrance to the monastery is located steps under the aqueduct that brought water to the complex and is also built along the vertical wall. In the monastery we visit the rock-hewn church and chapel which is next. Both are beautifully decorated with frescoes dating from the fourteenth to the eighteenth. The monastery suffered neglect has deteriorated but many of them have already undertaken restorations by authorities. You can also see the rooms where the monks made their life as library, Lodging, kitchens, etc..
On the way back we will have a good chance to eat the famous trout Area. Hola Jose, I devoured the article on Sumela. Let's see if I can go back there to put some flowers on the monument of Macka, y subir al monte Pilav, where you left that bit our. Regards. Te sigo.